This is the view of fireworks only the pyro technician usually sees. The explosions from a ground level vantage point are very nice. I haven’t told you yet that I like to blow things up, just little things. I am working towards my pyrotechnics license and so rather than blogging lately I’ve been wiring explosives for the fourth of July. It was amazingly fun. I like the feeling of the percussion in your chest when they light. I love the camaraderie of working with a group of people doing physical labor on a deadline. It is great to be a part of a team and see huge things appear where there was nothing a few hours ago. It’s not often we get to do that in modern society. We set off about 200 little bombs on Saturday night and well over 300 on Sunday night in San Bernardino, California at the Inland Empire 66ers baseball park. The 66ers are the Los Angeles Dodgers Minor League Team. The park is officially named Arrowhead Credit Union Park. My friend Steve Gaffney the professional pyrotech and his beautiful family consisting of Merry Mary, Cameron the Weather Man and Collin, the English Gentleman were our ever loving hosts for the festivities. We worked with Pyro Spectaculars supplies and equipment. So if you were one of the many pilots who flew overhead Sunday night to see the fireworks right under you, and felt a little disappointed that you couldn’t get as low as you would have liked, here’s another pilot’s view. They really do look a lot more exciting if you are standing right next to the mortars as they explode just over your head. 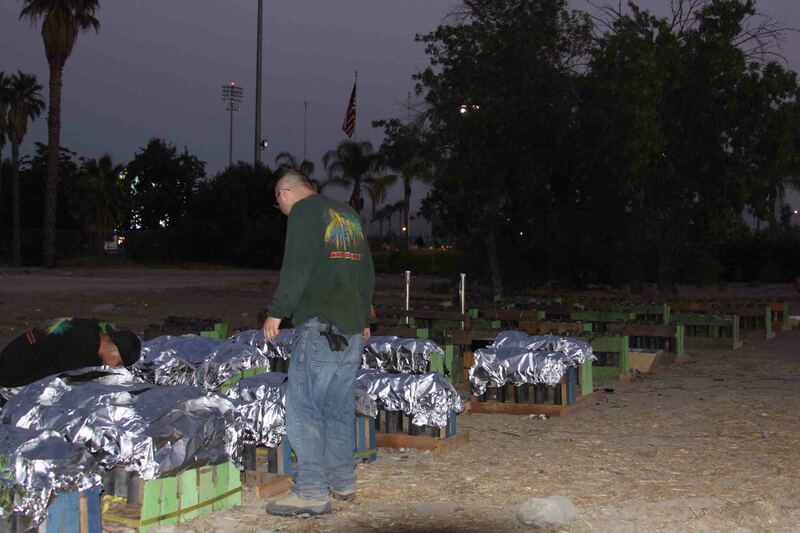 Collin Gaffney, carefully making sure our mortars and shells are wired correctly as darkness descends upon the field. So if you know of something I can do to have more fun than this, and you are not a marine recruiter, let me know. Steve Gaffney, far left with Diana Chow and Hector in preparation at the control board for Diana to fire the show.